FREE, PRIOR AND INFORMED CONSENT (FPIC): DOES IT GIVE INDIGENOUS PEOPLES MORE CONTROL OVER DEVELOPMENT OF THEIR LANDS IN THE PHILIPPINES? The 1998 Indigenous Peoples Rights Act grants indigenous peoples in the Philippines the right to Free, Prior, and Informed Consent with regard to development projects undertaken on their ancestral lands. 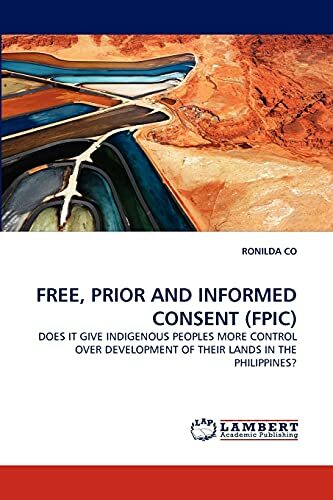 This book explores whether the current practice of generating such consent guarantees IP's control over development, particularly in relation to mining, that such procedures were designed to ensure.Two case studies involving Mamanwa and Manobo tribes suggest that the FPIC processes managed by NCIP have not led to an informed choice on the part of the IPs. Long-term impacts and benefits were hardly discussed by mining companies. Promise of financial benefits at the outset of the consultations short circuited the required FPIC process. Cultural erosion and the absence of long- term development plans have worked against the goals of the FPIC process.Traditional decision-making procedures employed by IPs are inadequate to generate the kind of conversation required to ensure Free, Prior and Informed Consent.The author recommends the use of third neutral party to facilitate the FPIC process to ensure a fair, equitable, and legitimate outcome for all stakeholders. RONILDA CO studied Urban and Environmental Policy and Planning at the Massachusetts Institute of Technology (MIT). She worked in the fields of natural resource management and dispute resolution in the Philippines. She is currently based in Bangkok, working on disaster risk reduction with multiple stakeholders in the Asia Pacific.